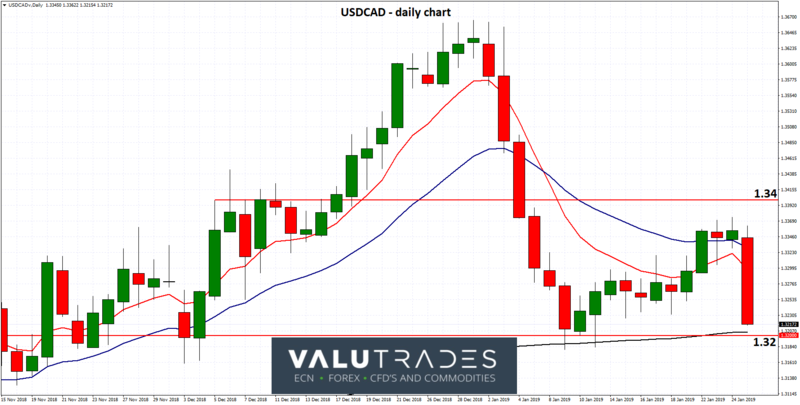 On Tuesday last week we covered the US30 index which continued throughout the week to struggle with resistance from the current key level of 25,000. 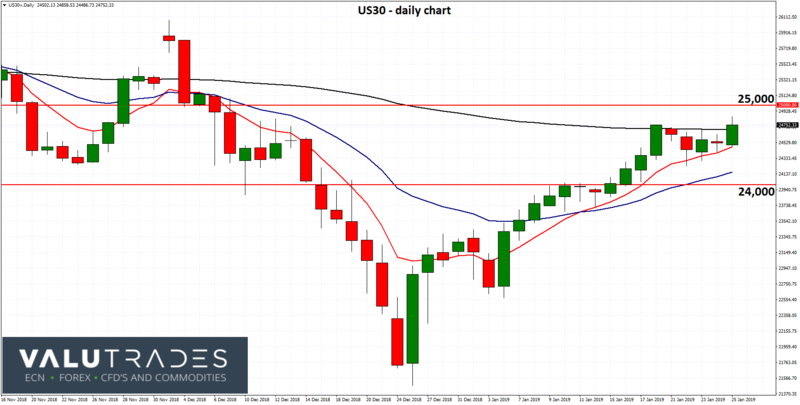 After falling to its lowest levels in 18 months below 21,500, in the last few weeks the US30 index has been able to rally well back towards the key 24,000 level where it met several days of resistance before moving higher towards 25,000. This has returned the index back into the range between 24,000 and 25,000 with both of these levels playing a significant role with the index in the last few months. As expected the 24,000 level did offer some resistance and it will be interesting to see whether this level props up the index should it decline from its current levels, and which key level it makes a run at breaking through. 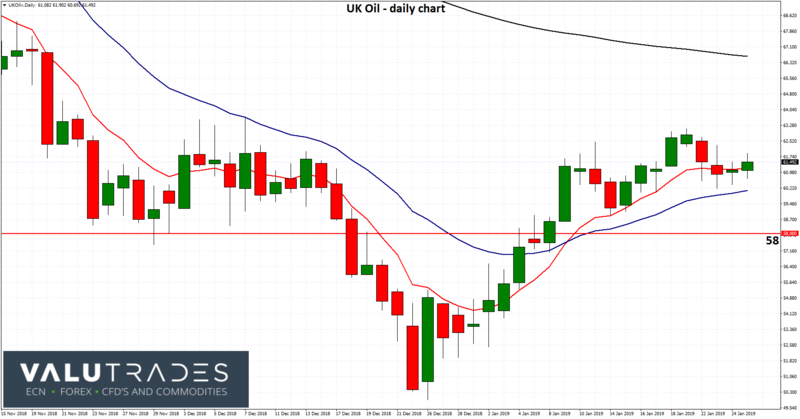 The current key level for UK Oil is 58 which has supported the index well over the last few months. Oil has started this year well rallying from 16 month lows below $50 at the end of last year, back up to the key $58 level and beyond, after its doom and gloom to close out 2018. The $58 level continues to play a role and has provided some support in the last couple of weeks as oil consolidates a little in that time. The $58 level supported oil very well for several weeks at the end of last year and is likely to continue to do so. Starting at the beginning of October, oil fell sharply from its multi-year high above $86 down to its lowest levels in 12 months below $58 at the end of November before falling lower to 18 month lows several weeks ago. 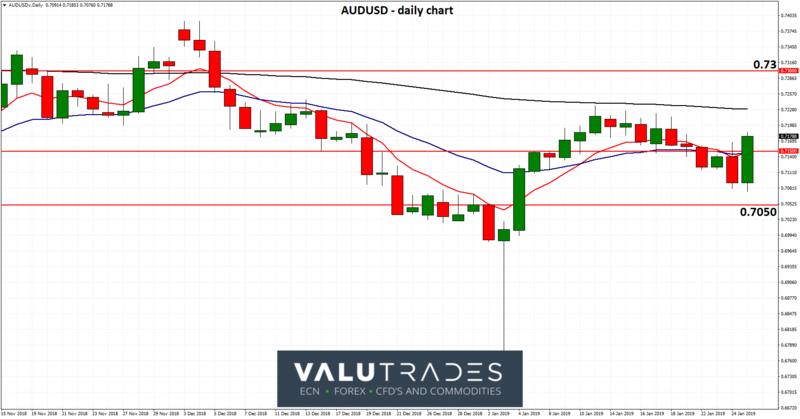 The current key level for the AUDUSD is 0.7150 which it has spent the last few weeks trading around.In the last week or so the AUDUSD has slowly but surely eased lower, and whilst it received some support from the key 0.7150 level for a few days, it has continued lower to a three week low back within the range between 0.7050 and 0.7150, before finishing the week moving strongly higher to back above 0.7150 again.Just prior to the decline, the AUDUSD had done very well to rally from its lowest level in many years below 0.67 up to a five week high a couple of weeks ago. You would have expected the support at 0.7150 to stay strong for longer, however it has since moved lower showing how strong the sellers are presently.